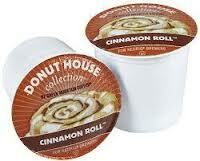 Cross Country Cafe has Donut House Cinnamon Roll coffee as their Wacky Wednesday deal! The K-Cups are $10.99 for a 24 ct. box. This is a very popular flavor so be sure to grab it if you want it. Shipping is $8 or FREE when you purchase 5 or more boxes. The deal is available to today, 2/20, only.